TIME explained what was perhaps the most controversial of its choices thus: "Hitler became in 1938 the greatest threatening force that the democratic, freedom-loving world faces today" (1/2/39). Hitler's rise began in 1919, when he joined the German Workers Party, which was renamed the Nazi party. Within two years he was the party's leader. In 1933, Hitler became chancellor of Germany and soon consolidated his power, banning other parties and establishing totalitarian rule. He put the unemployed to work in public programs, rebuilt the army and sent Jews, communists and others to concentration camps. 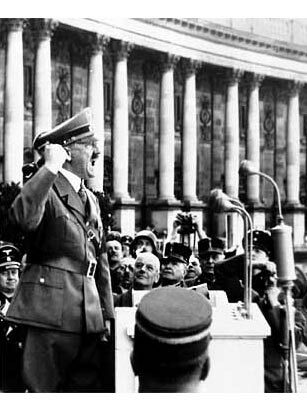 On September 1, 1939, Hitler began World War II by invading Poland. By 1941, German troops had become bogged down in Russia, and in 1944 the Allies began their advance on Germany. Hitler lived his final months in a Berlin bunker, committing suicide on April 29, 1945.